Tavi Gevinson is an actress, writer, and editor-in-chief of Rookie, a website for teenage girls. She has appeared in the feature-length film, Enough Said, guest starred on NBC's Parenthood, and performed on stage in This Is Our Youth. Tavi has written for Elle, The Believer, and the Chicago Tribune, and spoken at TEDxTeen, the Metropolitan Museum of Art, and the Sydney Opera House. She graduated from high school in Oak Park, IL, and now resides in New York City. Editor’s note: This is a print-only feature, originally published in The Great Discontent, Issue One. To read the interview in its entirety, pick up the print magazine in our online shop. When I was in the sixth grade, I was extremely bored. I had spent that first year of middle school trying to fit in, but it just wasn’t working. I enjoyed being in plays, but I needed a different outlet that was separate from people at school. My friend’s older sister had a fashion blog, and I wasn’t necessarily interested in fashion, but she had a way of thinking about personal style that I liked. Because I have basically grown up on the Internet, I didn’t think twice about what it meant to share something publicly online. I jumped in without knowing what I was talking about and without having my own style yet; I thought I’d figure it out as I went, and I did. I started my fashion blog, Style Rookie, in 2008, just a few weeks away from my 12th birthday. I posted photos of outfits, or new movies or designers I discovered, and chronicled my interests as they were evolving. I didn’t think of myself a photographer, but I would come home after school and set up a tripod out in my yard to take self-portraits. I had done a lot of acting at school and in community theater, so it made sense to use fashion to feel like different characters. What I liked about fashion was that it was never just about fashion. Only a few of my favorite designers studied fashion in school. For instance, one of the Rodarte sisters studied art history and the other majored in English literature. I liked that I could read about a designer’s inspiration for a collection and find out that it was tied to movies and music, and that lead to me discovering films and bands that became formative for me. Eventually, I started reading about feminism and became inspired by the Riot grrrl movement and Sassy Magazine. I had always thought of myself as a kid rather than a tween, but toward the end of middle school, I started to feel more like a teenager or young woman. I didn’t feel like there was a publication that was honest, creative, or inspiring in a way that I was craving, and I wrote about what that kind of modern-day magazine might look like. Then one day, I got an email from Jane Pratt, the first editor-in-chief of Sassy, saying, “You should start a magazine, and I’d like to help you.” I met with her a couple of times and, while we didn’t have anything super concrete at first, we had creative ideas that drove the vision for what would eventually become Rookie Magazine. I applied to college, but I’m going to take a year off before I go. I want to go to school in New York so I can have the best of both worlds instead of having to necessarily choose between going to school and having a career. I want Rookie to get to a place where I can oversee it from a greater distance, and I’m going to spend a lot of my gap year in New York working on that. It’s extremely helpful that I’m young and have an interesting success story, and that some morning show says, “We want to talk to you about being a kid.” It’s whatever, but ultimately, Rookie is not my blog and not just my space: I want it to have a life of its own. I wrote a list of 2014 goals in my planner. Some of them are really boring, like, “Get that weird mole checked out,” but on the last page, in all capital letters, I wrote: “NO MATTER WHAT, EASE UP ON WORKLOAD; READ BOOKS; GROW YOUR BRAIN; BUILD FOUNDATION SO YOU DON’T BECOME A HACK WHO TAKES UP SPACE; YOU ARE GOING TO GO TO COLLEGE; YOU CAN’T FAKE EDUCATION; THERE ARE NO SHORTCUTS IN GAINING A WEALTH OF KNOWLEDGE.” It’s not because I think you need a formal education to be smart; it’s just that I have the opportunity to go to college and I don’t want to get distracted. In the midst of all of this, I want to make sure that I am growing as a writer, editor, actress, and everything. With some people, their careers take off and they do all this work, but they don’t have the in-between time to experience life. Everyone is different, but the general consensus is that actors need to have experiences to pull from. I don’t want to fall into a trap where I’m just as strong of a writer when I’m 25 as I am right now because I just did a bunch of work instead of taking time to read and expand my vocabulary. In the next few years, I have goals that are kind of ambitious, but the most important one is making sure that I have time for myself. Maybe it’s uncool to call people out, but I feel like Bret Easton Ellis wrote books and screenplays, but then he started writing awful, edgy think pieces. Elizabeth Wurtzel wrote Prozac Nation, and it was a huge success that was made into a movie. But now she just publishes weird rants that no one edits because she’s a name writer, and people think, “Oh, we can put up anything she says because it’ll get hits no matter what.” I don’t want to be someone who is too busy to make sure I’m connected with what I’m saying and that what I’m saying is connected to the outside world. I try not to think about legacy because it gives me a lot of anxiety. It makes me feel like there’s too much weight to everything I do to the point where I find it hard to do anything. If we’re being realistic, people will remember Cleopatra and Marilyn Monroe. I’m not high on the list of legends, and that is okay with me. I find it very freeing. I’ve been putting things out into the world from a young age, and if I was too concerned with legacy, I would have constant writer’s block and be overly apologetic, compensatory, and over-explain myself. You can’t know what will be meaningful and resonate for people: I get surprised all the time by what people respond to in my work. Legacy is so out of our control. So many people think of Joni Mitchell as a 1960s-era hippie folk singer, but she had so many other strong and widely acclaimed albums besides Blue. My legacy is not in my control. It won’t matter to me and maybe not even to other people after I die, so what’s the point? Enjoy this excerpt? 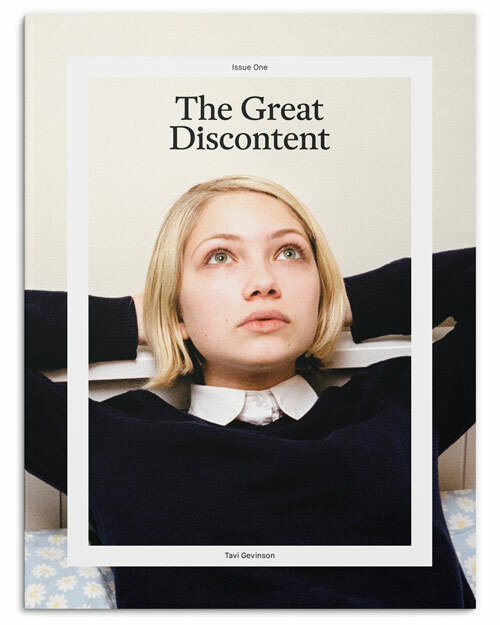 Read the entire interview in The Great Discontent, Issue One, available in our online shop.